Wonderful hotel with amazing historical architecture. Great people working there. Very friendly! Highly recommend! 10-Feb-2019 Verified Review, stayed from Sat Feb 09 to Sun Feb 10 2019 at a $204.30 average nightly rate. Built in 1923, the historic Millennium Biltmore Hotel has been the premiere choice for celebrities and presidents for over 85 years. Experience distinctive service and classic European style in one of our 683 luxurious guest rooms and suites, with amenities such as Health Club with Roman-style indoor pool, 4 bars and restaurants, in-room dining and 24-hour business center. 70,000 square feet of stunning meeting and banquet space includes the legendary Biltmore Bowl, which hosted eight Academy Award Ceremonies in the 1930s and ' 40s. Plus with a convenient location in the heart of downtown's cultural and business districts, the hotel is just steps away from major attractions like the Staples Center, NOKIA Theater, Music Center, Walt Disney Concert Hall, L.A. Live and the Museum of Contemporary Art, and just a short drive from Hollywood, Beverly Hills and the beach cities. We offer a health club and fitness center for guests who stay active while traveling.Facilities include a steam room, bubbling Jacuzzi™ (under renovation until further notice) and dry sauna, as well as cardiovascular and weight equipment. The indoor Roman-style pool is replete with teakwood deck chairs and cold showers, reminiscent of cruise ships from the 1920s with its original tile and mosaic work. Men's and women's locker rooms with showers are also located inside.The Health Club at this downtown L.A. hotel is complimentary for all guests and accessible by room key only. Health Club open 24 hours; pool open from 6:00am - 10:00pm. Local Shuttle Info: Uber. Lyft and Taxi services available. Rental car company available on-site. 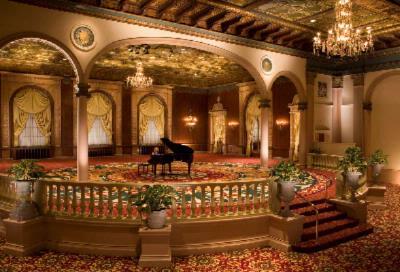 Below are the meeting, banquet, conference and event spaces at Millennium Biltmore. 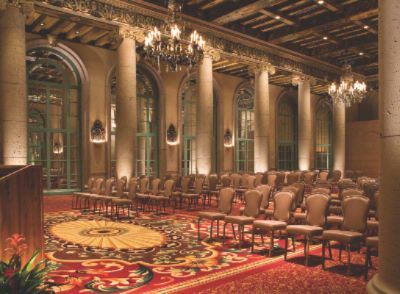 Feel free to use the Millennium Biltmore meeting space capacities chart below to help in your event planning. Hotel Planner specializes in Los Angeles event planning for sleeping rooms and meeting space for corporate events, weddings, parties, conventions, negotiated rates and trade shows. 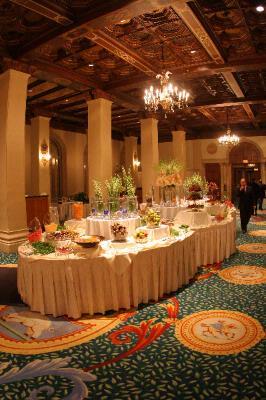 The Biltmore Bowl, once home to the Academy Awards, is the hotel's largest ballroom with 2 levels, a built-in stage, and large foyer perfect for receptions or pre-function space.The Bowl is equipped with state-of-the-art audio/visual capabilities, including an advanced sound system, programmable lighting controls and computer projection. 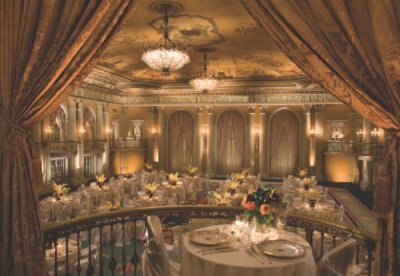 140 x 120 x 14 Ft.
A hand-painted 30-foot ceiling, majestic balconies, magnificent Austrian crystal chandeliers, glittering mirrors and lush drapery enhance the stunning elegance of this ballroom, the jewel of the Biltmore. The room maintains a rich history tied to both the hotel and old Hollywood - the Academy of Motion Picture Arts & Sciences was founded here in 1927. 90 x 70 x 29 Ft. The exquisite Gold Room, once the Biltmore's elite dining room, is built on two levels separated by a curving balustrade and tall columned arches. The lower level serves as an intimate foyer, reception or break area to complement the meeting, dining or dancing space of the upper tier. The room features gold coffered ceilings, wood-paneled walls with elegant sconces and stately arches and shimmering crystal chandeliers. 66 x 90 x 23 Ft.
Hand-painted ceiling motifs of harvest and hunt reflect the origins of this, the hotel's original main dining room. Rounded faux-travertine columns and antique bronze chandeliers create a stately and dramatic setting for conferences and banquets. 101 x 54 x 24 Ft.
An impressive yet intimate setting with a beautiful wood-vaulted ceiling and graceful colonnades. Friezes and medallions depicting Columbus and Queen Isabella line the north wall. The Tiffany connects by a series of doors along one side to the adjacent Crystal Ballroom, making it a perfect area for a reception or pre-function meeting room. 88 x 48 x 17 Ft. 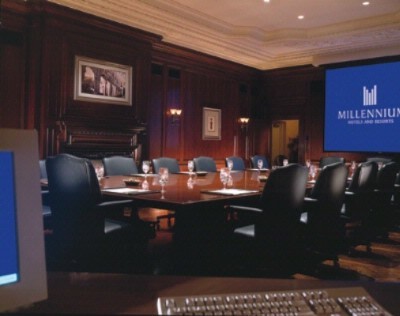 The Millennium Boardroom is actually five unique spaces in one, perfect for conducting important business, relaxing and dining in utmost privacy and comfort. A comfortably furnished living room and handsome game room feature an antique pool table and serve to break the ice before and after meeting time. An enormous walk-in closet stores coats and other valuables to maintain a clean space. The stately boardroom at the heart of the suite features rich wood paneling and a cozy fireplace with carved mantle, plus plenty of space for a boardroom table or other setups.The Boardroom features a fully interactive environment, equipped with five separate telephone lines and high-speed Internet access. A convenient audio/visual system remotely controls a 3100 Lumens LCD projector, VCR, CD/DVD player, lights, a 10'x10' retractable screen and surround-sound system. Videoconferencing is also available. 24 x 38 x 11 Ft. Beneath the Biltmore Bowl and connecting to it via elevator or stairwells, the enormous Regency Room offers 16,800 square feet of exhibit space directly accessible from the hotel's loading dock. 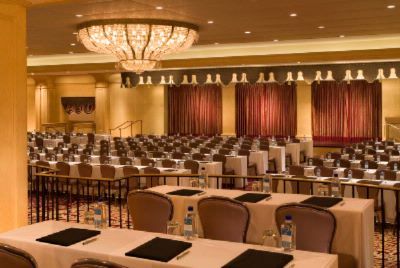 The room features wall-to-wall carpeting and bright lighting, offering a perfect rehearsal space for the Bowl and a flexible area to accommodate large meetings. 140 x 120 x 9 Ft.
Once a five-star venue for dinner and dancing, Bernard's unique multi-level space, rich wood paneling and direct access to it's own kitchen make it perfect for receptions or intimate VIP banquets. 81 x 44 x 12 Ft. 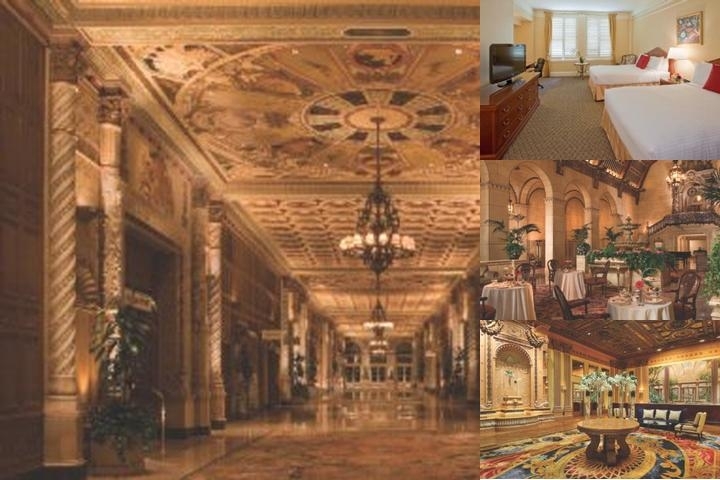 Perfectly suited for both exhibits and social functions, the Heinsbergen sits in the beautiful South Galleria wing of the hotel, with easy access to the Biltmore Bowl just below. 61 x 78 x 10 Ft. The Roman Room is one of nine unique rooms on our Mezzanine meeting level, perfect for small banquets, breakouts, executive meetings and symposiums. Architecturally themed in a Greco-Roman motif, the Roman features high ceilings, hand-painted wood beams and colorful chandeliers. A short flight of stairs leads to the Main Galleria and Ballrooms 1 level below. 24 x 47 x 19 Ft. The Corinthian Room is one of nine unique rooms on our Mezzanine meeting level, perfect for small banquets, breakouts, executive meetings and symposiums. Architecturally themed in a Greco-Roman motif, the Corinthian features high ceilings, hand-painted wood beams and colorful chandeliers. A short flight of stairs leads to the Main Galleria and Ballrooms 1 level below. 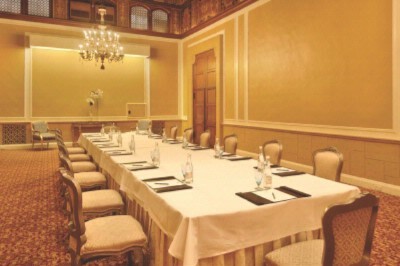 The Grecian Room is one of nine unique rooms on our Mezzanine meeting level, perfect for small banquets, breakouts, executive meetings and symposiums. Architecturally themed in a classical motif, the Grecian features beautifully detailed carved ceilings and wood-paneled walls. A short flight of stairs leads to the Main Galleria and Ballrooms 1 level below. 22 x 23 x 11 Ft. The Athenian Room is one of nine unique rooms on our Mezzanine meeting level, perfect for small banquets, breakouts, executive meetings and symposiums. Architecturally themed in a classical motif, the Athenian features beautifully detailed carved ceilings and wood paneling. A short flight of stairs leads to the Main Galleria and Ballrooms 1 level below. 35 x 23 x 11 Ft. The Moroccan Room is one of nine unique rooms on our Mezzanine meeting level, perfect for small banquets, breakouts, executive meetings and symposiums. A short flight of stairs leads to the Main Galleria and Ballrooms 1 level below. 30 x 16 x 9 Ft. The Florentine Room is one of nine unique rooms on our Mezzanine meeting level, perfect for small banquets, breakouts, executive meetings and symposiums. A short flight of stairs leads to the Main Galleria and Ballrooms 1 level below. The Corsican Room is one of nine unique rooms on our Mezzanine meeting level, perfect for small banquets, breakouts, executive meetings and symposiums. A short flight of stairs leads to the Main Galleria and Ballrooms 1 level below. 28 x 16 x 9 Ft. The Cordoban Room is one of nine unique rooms on our Mezzanine meeting level, perfect for small banquets, breakouts, executive meetings and symposiums. A short flight of stairs leads to the Main Galleria and Ballrooms 1 level below. 26 x 28 x 10 Ft. The Mediterranean Room is one of nine unique rooms on our Mezzanine meeting level, perfect for small banquets, breakouts, executive meetings and symposiums. A short flight of stairs leads to the Main Galleria and Ballrooms 1 level below. 37 x 18 x 11 Ft.